Cucumber water isn’t just for the spa. Drinking fruit-infused water is one of the best ways to increase water intake. The recipes below will keep you hydrated and give you lots of nutrients. Here are 15 fruit infused water recipes. You will need one sliced strawberry, three basil leaves, four cucumber slices and a glass of ice water. Mix all the ingredients and then wait for 30 minutes before drinking. Thinly slice three or four ripe kiwis then toss them in a mason jar. Add 8 cups of water. Refrigerate the mixture until it’s cold and then enjoy. Mix one cup of pineapple pieces with one inch of freshly sliced ginger and eight cups of water. Refrigerate the mixture for at least 3 hours. To make cucumber lavender water you need one thinly sliced cucumber, two fresh lavender prigs or one teaspoon of dried culinary lavender, and eight cups of water. Put all the ingredients in a mason jar and refrigerate. Remember to sieve the water before drinking if you use dried lavender. Mix a handful of blueberries with two oranges cut into wedges and then add 8 cups of water. Refrigerate the mixture until it is cold before drinking. This is one of the easiest recipes to prep. Put one thinly sliced cucumber in a mason jar and add 8 cups of water. Refrigerate the mixture or let it sit for 3 hours before drinking. Mix a handful of blueberries with two fresh lavender sprigs and 8 cups of water. Refrigerate until it’s cold. Cut two lemons and one lime into wedges and toss them in a mason jar. Add 8 cups of water then refrigerate the mixture for at least 3 hours before drinking. For this mixture you need four cups of sliced strawberries, and 8 cups of water. Refrigerate for 6 hours or overnight before drinking. Mix two slices of watermelon (cut into quarters) with a handful of basil leaves and 8 cups of cold or ice water. Refrigerate for at least 3 hours before drinking. Put six cups of water, a handful of blueberries and two mandarin oranges (cut into wedges) in a pitcher. Refrigerate the ingredients for 2-24 hours before drinking. This is a great mixture to help fight dehydration. To make it you need one thinly sliced apple, eight cups of water and two cinnamon sticks. Feel free to add a pear and/or a plum. Mix four fresh ripe peaches (sliced) with 5 one inch chunks of sliced and peeled ginger and 8 cups of water. Feel free to add one fresh sliced lemon. Let the mixture sit for a few hours or overnight. Mix six cups of water with two cups of freshly squeezed lemon juice, one sliced lemon and three tablespoons of dried lavender. Refrigerate the mixture for two hours before serving. Slice ¼ pineapple into small pieces and put it in a mason jar with 10-12 leaves of fresh mint. Add 6 cups of water and refrigerate the mixture for at least 3 hours. 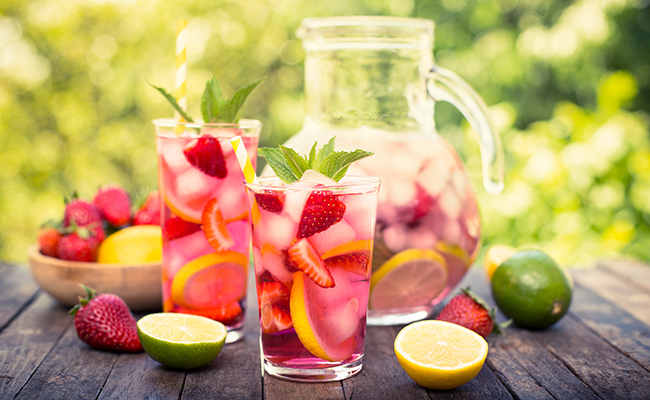 What’s your favorite fruit infused water recipe? Thanks; but, I like my water plain.